With major markets on the move, today James Turk told King World News that despite the recent weakness in gold, a major revaluation spike is coming in the gold market. Turk also added some additional comments to go along with the extraordinary chart he sent to KWN yesterday. Below are Turk’s comments and his fantastic chart. Turk: “I think the following chart puts several key markets in their proper perspective, Eric. 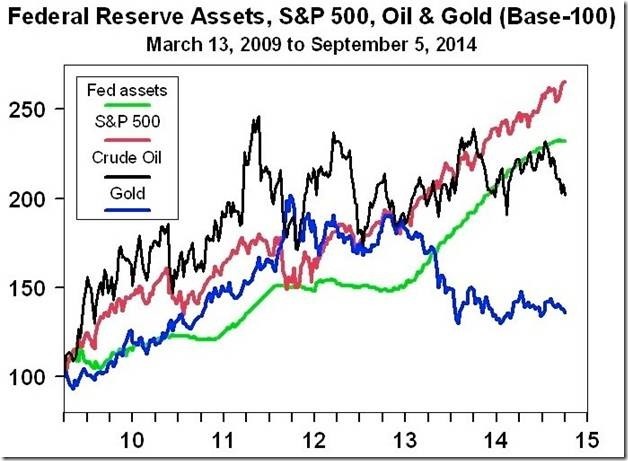 It shows the correlation between the Fed’s balance sheet, S&P 500, gold and crude oil. 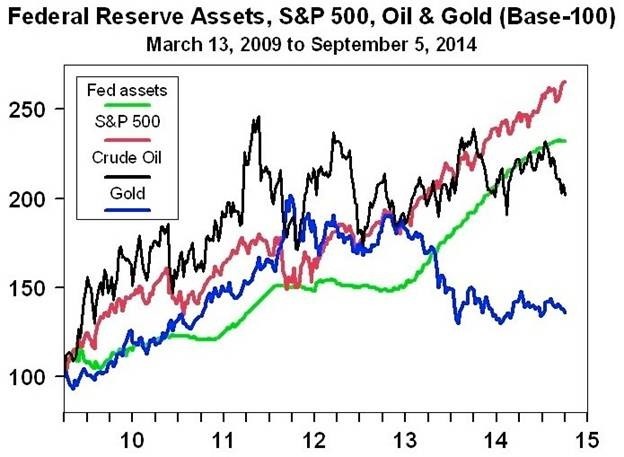 This is a base-100 chart that plots the relative movement in these assets at the close of each week from March 2009, which is when the Fed announced its first QE program (see chart below). Today former US Treasury official, Dr. Paul Craig Roberts, warned King World News that the threat made by Putin today just stunned the United States and Europe. Dr. Roberts also discussed how the threat unfolded today at the International Economic Forum in Russia. Below is what Dr. Roberts had to say in this powerful interview. Dr. Roberts: “Yes. One of the advisors to Putin had publicly complained that Washington had put unprecedented pressure on American and European countries not to attend. But it turns out that present at this forum, which began yesterday and continues today and tomorrow, there are official delegations from 62 countries, and the CEOs of 146 of the major companies in the world…. Today former US Treasury official, Dr. Paul Craig Roberts, warned King World News that 2014 will be a dangerous year of reckoning for the United States. Dr. Roberts also warned a collapse is coming that will be so powerful it will overrun the Exchange Stabilization Fund and other measures now in place by central planners to protect against such catastrohic market events. Below is what Dr. Roberts had to say in this remarkable interview. Dr. Roberts: “The people who are saying that the Ukraine crisis will cause a flight to safety and a rise in the dollar’s value are overlooking the main impact of the crisis in the Ukraine which comes from Washington’s threat of sanctions against Russia. And the Russian government replied to this threat by announcing that they were simply leaving the dollar-based payment system…. On the heels of another wild trading week, today a 42-year market veteran spoke with King World News about the coming chaos that investors around the world need to brace for, as well as $12,000 gold, $50,000 gold and much more. Below is the incredibly powerful piece by Egon von Greyerz, who is founder of Matterhorn Asset Management out of Switzerland, where he also includes 3 astonishing charts. The US in now slowly entering its hyperinflationary phase. Food prices are already up 19% in the first three months of 2014. On an annualized basis that is 76% which is a clear sign that hyperinflation is already starting…. Today David Stockman spoke with King World News about the escalating crisis in Ukraine, gold, and a terrifying “financial and economic volcano.” KWN takes Stockman’s warnings very seriously because he is the man former President Reagan called on in 1981, during that crisis, to become Director of the Office of Management and Budget and help save the United States from collapse. Below is what Stockman had to say in part I of a series of powerful interviews that will be released today. Stockman: “I think there is a lot of insanity loose in the world, particularly in Ukraine. What the U.S. government and the Western European capitals are doing is stupid and dangerous…. With continued chaos and uncertainty in global markets, today KWN is publishing another incredibly important piece that was written by a 60-year market veteran. The Godfather of newsletter writers, Richard Russell, exposes the devastating truth about what the United States has been reduced to. He also discussed what is happening in major market as well as what investors should be doing with their own money right now. Russell: “The US is now actually borrowing to pay off the interest on its huge and growing debt. The Treasury continually issues bonds. But who will buy them? Can you believe it, the US is reduced to actually buying its own debt via the Federal Reserve. What does the Fed buy our debt with? It buys our own debt with money that it conjures up out of thin air by means of a bookkeeping entry. The Fed has been doing this for years and the Fed’s basket of bonds is now over $4 trillion dollars worth of assorted bonds. The continuing buying of bonds (QE), now $60 billion every meeting, has driven stocks up to overvalued levels. Companies are taking advantage of the lower rate environment in the limited period that these low rates are going to be around. Now the Fed is trimming back its QE ($10 billion less at each meeting, so far) with the thought that QE will be completely removed by the end of the year — this on the hope that the US economy by year end will be strong enough to function on its own without any QE. After February’s report that more jobs had been created than predicted, the Fed’s plan to eliminate QE was strengthened. As to valuations, the S&P 500 now trades at 16 times its component companies’ earnings for the past year. That is double its level of five years ago and almost identical to the level at which stocks topped out at the beginning of the decline in October, 2007. Nobel Prize winner Robert Shiller puts the S&P at 25 times average earnings, far above the historical average of 15.5. Today former US Treasury official, Dr. Paul Craig Roberts, spoke with King World News about the ongoing danger the world faces because of the crisis in Ukraine. Dr. Roberts also warned “the Chinese government regards Washington as an insane asylum.” The interview ends with an ominous warning for the entire world. Below is what Dr. Roberts had to say in Part III of this remarkable series of interviews. Dr. Roberts: “Putin has already said that he reserves the right to protect the Russian people in Ukraine as well as Russian strategic interests in Ukraine, and he means it. He wouldn’t say it if he didn’t mean it…. Page queried in 0.685 seconds.